I was only twelve years old when my cousin first introduced me to a game boy emulator with the first generation of Pokemon games downloaded on it. I had never played a game as captivating as Pokemon Blue and by the end of the visit at my aunt’s house, I was told that four hours had passed when it only felt like I was only playing for half an hour. Years later, I am one of the many Pokemon Go players who are eager to catch these iconic creatures and become a worthy opponent in nearby gyms- but for more reasons than to just “catch ’em all”. Video games have always been an integral part of my life. Despite not speaking until I was four, I was proud that I beat Super Mario Brothers 3 on my new NES at five. Also in that same year I clung onto Tetris because I was able to reach levels that no one in my family could match. With the upgrades of an SNES, N64, PS1 and PS2 throughout the years, I have easily played thousands of hours of games that have served as entertainment to boredom and an escape from my reality. 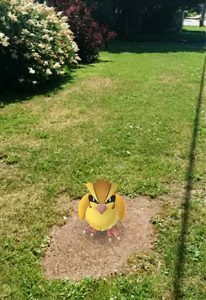 A Pidgey in my neighborhood! I had the beginnings of Dermatillomania at 10 years old, just before my father had his brain injury, but I didn’t indulge in video games chronically until afterward. I was uncomfortable with my appearance, didn’t fit in with others, and video games served multiple purposes. I have been whisked away for hours at a time by turn-based RPG adventures, have become number one in old popular racing games, and strained my brain with a variety of strategy games. It kept me busy, entertained, out of trouble, introverted, and isolated with what I couldn’t control, but it gave me relief from stresses in my life. This isn’t the part of me that has been talked about. According to some outlets, I’m simply a woman with a disorder. I don’t have a personality, hobbies, or rights and I certainly wouldn’t fit the narrative that others want to create of a drab soul who does not know of any happiness. Luckily my life story was correctly portrayed in the documentary Scars of Shame and I am seen playing my various old consoles as a way of keeping myself and my hands occupied so that I didn’t compulsively pick my skin. Scars of Shame was filmed years before I appeared on “The Doctors” with Karen Pickett for help with my Dermatillomania and in it I discuss how I believed video games helped in distracting me from my picking. During my therapy I learned that my “automatic” picking worsens if I multi-task on electronics or play video games for too long. As a result I’ve had to calm down the stimulation and baseline anxiety by using mindfulness techniques instead of putting my mind, and potentially picking, into overdrive. Screenshot from “Scars of Shame“. Pokemon Go challenges my immediate fear of leaving the house by replacing it with an enticing activity that encourages me to get out of the safe confines of my home. After living with chronic pain on the lower left side of my back for 3.5 years, which has since improved by 85%, I am still afraid to leave the house in fear of becoming too weak because of the muscle deterioration that occurred while I waited for to be properly diagnosed. Despite being an advocate who has conquered picking with the same percentage of success as my chronic pain, my mental health did not improve once my back pain simmered down. I have had to deal with with the results of a traumatic medical procedure from this past April which now include panic attacks of the vomiting, diarrhea, and the- sickening- stench- of- sweat kind. I’ve had withdrawals from a heavy dose of Gabapentin, an anti-epileptic medication with anti-anxiety properties used for pain, which lessens my desire to leave the house. The picker in me finds it therapeutically exhilarating to swipe Pokestops because of a certain satisfaction I get after tapping the rewards that it spawns. My anxiety in public decreases when I have “goals” in my brain related to the game, which makes it easier to silence generalized worries while in the outside world. While chasing Pokemon with my husband I noticed how people are hanging around parks and landmarks more than they have in recent years. Pokemon Go is a real world adventure that pushes people to step out for fresh air instead of hiding away from it. While at one of my city’s hot spots for Pokemon, I had people engage in fun conversation with me about the game. Human interaction of this kind with a new sense of community didn’t exist until the release of this game. While the news likes to focus on the misfortunes and dangers of Pokemon Go, I see hope that this game is improving lives by allowing us to connect to others and our environment. Humans are not made to be cooped up, even if some of us have a fear response that tells us that it’s better to remain indoors than be exposed to uncontrolled variables outside. Unlike any other game I’ve obsessively played in the past, Pokemon Go has encouraged me to walk a few steps further to hatch eggs and reach Pokestops, which will help in my physical recovery. As for my mental health, having the incentive to get out the front door is a step in the right direction toward learning how to rebuild myself and maintain my baseline anxiety levels. 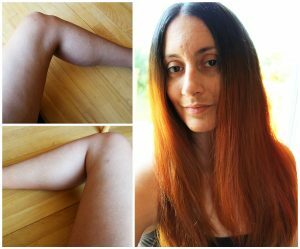 “Embracing Dermatillomania: My Recovery Story“.